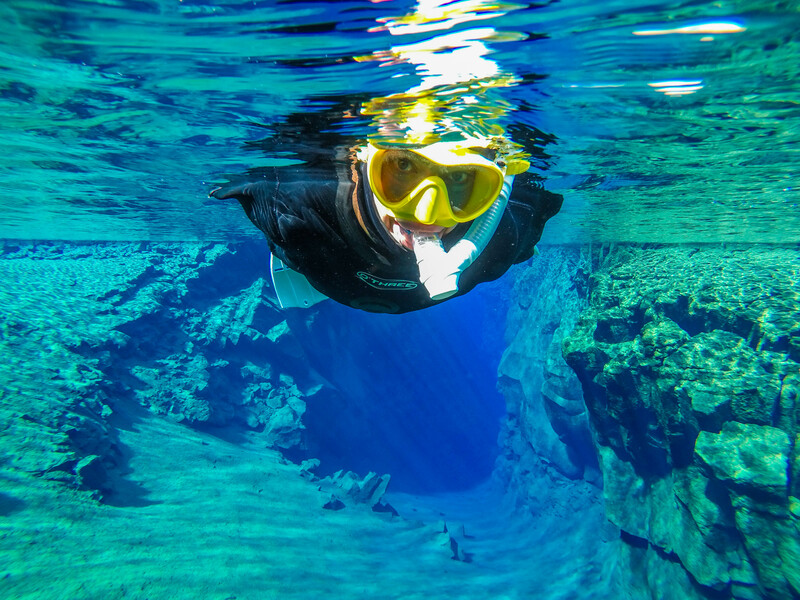 Join this fantastic excursion to explore the glacial depths of Iceland’s premier dive spot, the exquisite Silfra Fissure, with this incredible snorkelling tour. This is an amazing opportunity for any explorers in Iceland looking to visit one of the most unique places, not just in the country, but in the world. Get your picture taken with a GoPro while swimming across the continents and receive them on your email immediately after your tour at no extra cost! You will begin this tour at the designated meeting point, Silfra Parking lot by the marked van at Thingvellir National Park, a UNESCO World Heritage site. Once here, you will take a short journey through the volcanic, moss-laden fields of the National Park, finally unloading at the Silfra car park. Here, you will listen as your friendly and experienced PADI Divemaster guide provides a quick safety briefing. 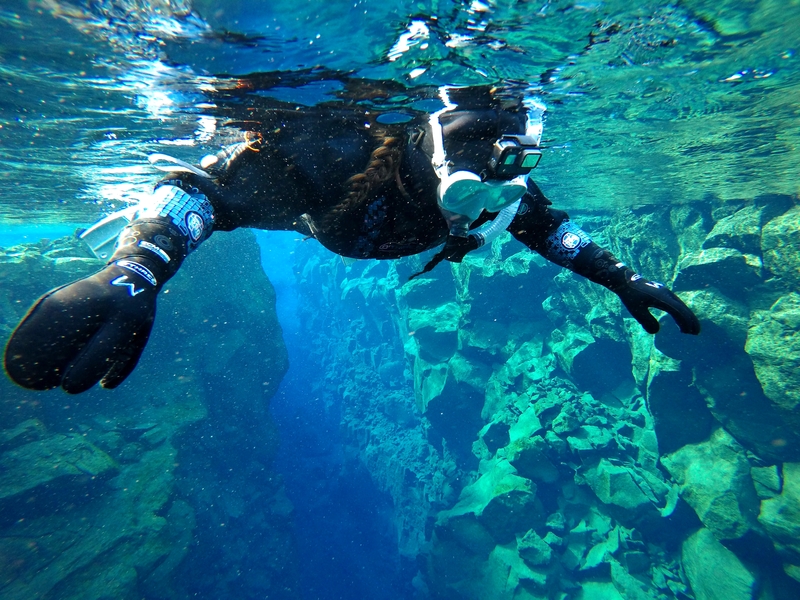 They will also hand out all of the necessary kits for snorkelling in Silfra, including neoprene hoods and gloves, a thermal undersuit, a drysuit and, of course, your own mask, snorkel and fins. This equipment will keep you buoyant throughout your time in the fissure, as well as offering a great deal of thermal protection against Silfra’s 2°C / 35°F glacial water. Once you enter the water, you will be immediately awestruck by the incredible shades of blue so prevalent in the fissure, as well as its jagged, algae strewn canyon walls. As you float above this canyon, you will have the opportunity to touch each side; this means that you’re placing your hands on both the North American and Eurasian tectonic plates (one of the major reasons as to why Þingvellir is so internationally beloved). Moving along the fissure, you will discover Silfra Hall (the fissure’s widest section) and the magnificent Silfra Cathedral (the fissure’s deepest section), as well as a gorgeous shallow oasis at the fissure’s end known as the “Real Blue Lagoon”. So don't delay any further! Hurry now and you too can discover the amazing sights of Silfra glacial fissures, one of the major wonders to be found in Iceland. Check availability by choosing a date. Departure time : 09:00, 10:00, 11:00, 13:00, 13:30, 14:00, 15:00. Meeting point is in Silfra parking by where the marked company vans are 20 min before the tour starts. You can park the car at the public parking P5 situated 2 minutes from us, then walk to the company parking. You can look up "Tröll Snorkel Meeting Point" on Google Maps to sinf the exact locaiton. If you need assistance finding it, seek guidance from your hotel's reception or contact your tour provider directly. Have a great tour! - Have read, signed, and followed directions on the Snorkeling Silfra Medical Statement Form. You can sign the form at the meeting location. You will receive a link to it after you book the tour. - Be comfortable in water and be able to swim. - Communicate in English or have an interpreter with you at the time of the tour. - You must be ready to wear a tight and constricting dry suit to protect your body from the cold. - You must be a minimum of 150 cm and a maximum of 200 cm in height and weigh between 45 and 120 kilos along with being physically fit. - You must be a maximum of 65 years of age to participate in this tour. If you are over 60 years of age, you need a medical waiver, available on page 2 of the medical form. - You must be a minimum of 12 years of age to participate in this tour. Participants under the age of 18 must be accompanied by a parent or adult guardian booked on the same tour. - If you are over 45 and partake/have partaken in pipe smoking or heavy alcohol intake, you need a medical waiver. - Please note that should you have any neurological, circulatory or respiratory problems or underlying diseases, battled any illnesses or have any physical problems you might have to turn in a physicians allowance to participate in this tour. Snorkling Silfra was an invigorating and unique experience! On top of seeing the cool fissure and water colours, being in the cold water and getting numb lips, hands and feet actually made the daily cold winter weather in Iceland less daunting; so I got out in the cold more and had even more fun! Guides were friendly and communication (regarding medical forms and date changes) were prompt and accommodating. Thanks Guide to Iceland and Troll Expeditions! This experience was my favorite part of the trip, we had so much fun with our guide Ricardo. The water is so clear and beautiful. I would do this over and over again, highly recommend! This was a very unique experience. My husband loved it, but the cold in my hands and feet really got to me. The rest of your body stays warm and dry (your feet also stay dry, but not as warm) but your hands get wet and stay wet during the duration of the snorkel. It was really cool being able to drink the water in the fissure and it was very pretty. Our tour guide was awesome and we got a ton of pictures from them. If you are going to do it, this company is definitely the way to go. Just make sure you are prepared for cold hands and feet! We also went in January, so in the summer might be better on the cold, at least before and after being in the water! This was an amazing experience even in December! They had a box truck for us to change in, dry bags to store belongings and were most helpful in getting us ready. Our Guide was Wesley and recommend you request him. He was awesome! We are a fun group and he loved bantering with us. More importantly, he looked after those who were nervous, and when my wife decided she was too scared to go into the water, he treated her with respect and dignity. Strongly recommend Troll and Wesley. Pictures are included and that was a bonus! It was amazing!! It was my first time snorkeling ever so I was little nervous but I’m glad I did it. Water was so pure and it wasn’t that cold while snorkeling. Our guide Dimitris was wonderful, he was very kind and really funny! I would 100% recommend this to everyone! This tour is a must when in Iceland! Matias our guide was amazing! The views are incredible both in and out of the water!! I would highly reccoment this even in November like we did it! 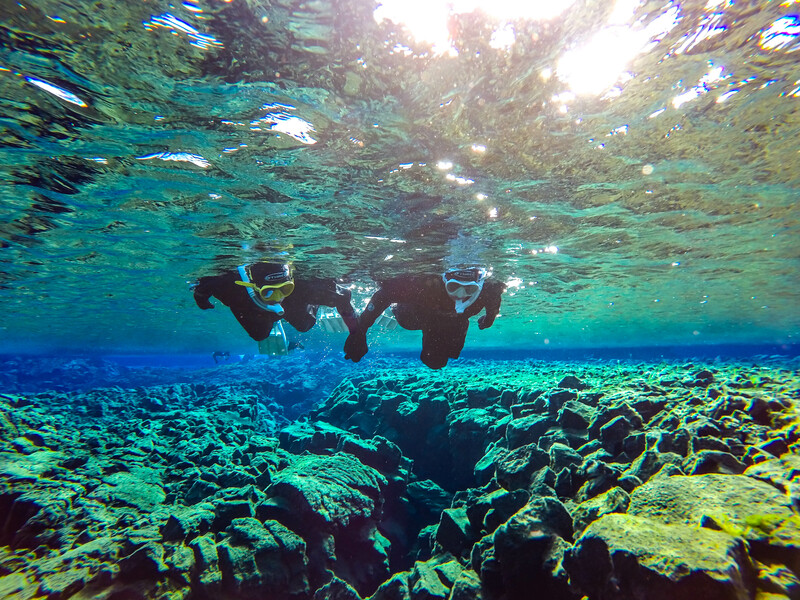 Snorkeling in the fissure between the North America and Eurasian plates was definitely an unforgettable experience, I've never seen this kid of clarity underwater. Mother Nature is an amazingly talented artist to decorate this planet! Our guide, Cordelia, she's informative and passionate, took good care of all of us. It was my first time to snorkel by wearing a drysuit, I was a bit worried about the water temperature around Nov. at the beginning, but it was surprisingly not that cold as I expected. This beautiful experience will stay in my memory forever, absolutely recommend to anyone! This was such a cool experience! Our guide Dimitrus was fantastic, he was knowledgeable about the site, he was engaging and made the experience a lot of fun, too. For those who are wary, it was not as cold as expected and totally worth going on this tour to see such an incredible place! This was my first time ever snorkeling and it was a blast! PH was a great tour guide that gave us alittle history about Iceland and the surrounding area and then a fun swim taking some awesome photos of my friends and I. Definitely recommend this group if looking for a snorkeling tour! We Had a great time at Silfra our guide Dimitri was great he told us everything about the site history and all safety standards that we must follow. Troll Expeditions treat us super great and if you are planning to visit Iceland this tour is the one that you need to do it. Choose Troll Expeditions you wont regret! Snorkeling with Troll Expeditions was awesome at Silfra! Our guide Wesley was great and told us all about the history of the area. He made sure to take plenty of pictures and let us take our time snorkeling, never feeling rushed. We were a small group and it was a great experience! Silfra Snorkel with Troll Expeditions was simply amazing! Our guide Cordelia was great explaining the history behind the site and explained in detailed the use of the gear which made us feel comfortable and safe :) Cordelia took great pictures to remember the experience and emailed them very soon after the tour. I want to highly recommend Troll and Cordelia as tour guide if you are considering this at all. Troll appears to be the only company to include pictures at no extra cost. Must do in Iceland for sure! Incredible from beginning to end! Our tourguide Kate, from Troll Expedition was funny, friendly and considerate! We felt very safe with her on our team, and greatly appreciate the pictures she took of us for free! This was a really fun tour!! Even though the water was obviously freezing, the view made it worth it. Christina, our guide was super funny and welcoming, and it was an over all great experience. Family went snorkelling at Silfra with Troll in August and loved it. Guide Christina was very knowledgeable and helpful. Definitely worth doing and would recommend the company. Book for an early slot and there’ll be less queueing to get in the water and more chance of finding a parking space at Thingvellier. This tour was an otherworldly experience! We went snorkeling on July 1st at 13:00. Our guide Cordelia was very nice and funny and very professional about all the gear and safety so I felt very secure going into the water. I followed the recommendations online about clothing and was not cold at all. The company also provides an underlayer under the drysuit which was really nice. The tour itself was unbelievable. The water was crystal clear and you could see the bottom of the lake the whole time with all the different colors. Cordelia brought a GoPro with her and took a lot of memorable pictures of the people on the tour and the picturesque landscape. The pictures were then sent to us online at no extra charge. When we got out of the lake I was still warm and they provided us with hot chocolate and cookies. Very appreciated :) I highly recommend this company and Cordelia if you want to explore Silfra! This tour exceeded my expectation! It was so pretty in the water. I was worried that it would be too cold to enjoy, but that was totally unnecessary. The dry suit kept me warm and dry. It was cold and windy that day, but in the water I was totally fine. My hands were cold and I was holding a Gopro, but it wasn't unbearable. I usually get cold really easily, but I didn't have a problem at all. We were a bit later for the tour because I was at a wrong meeting point, but our guide Ronan was waiting for us patiently and we had an amazing time. He also took lots of pictures for us at the tour. I highly recommend! This tour was amazing! This was the highlight of my trip to Iceland without doubt! Every part of this tour was just so much fun. We got to Thingvellir before 9 and explored the national park of Iceland, it made our day one of a kind. Perfect place to Snorkel. Thingvellir and Silfra are amazing, what a day we had. The guide was amazing and clearly very experienced. Two touches that made this tour even more special, the hot chocolate after and the pictures we got. Great customer service. This tour was just amazing! Everything in Thingvellir is so beautiful and it was so cool to be able to snorkel in Silfra! I wish I could do it again! Our guide was really one of a kind! He was so sweet and really went above and beyond to make sure everyone felt safe.